Boreal Mountain Resort opened for the 2017-18 season on Wednesday, Nov. 8. At this point, Boreal is operating one lift, which took skiers and snowboarders to the top of a beginner run. 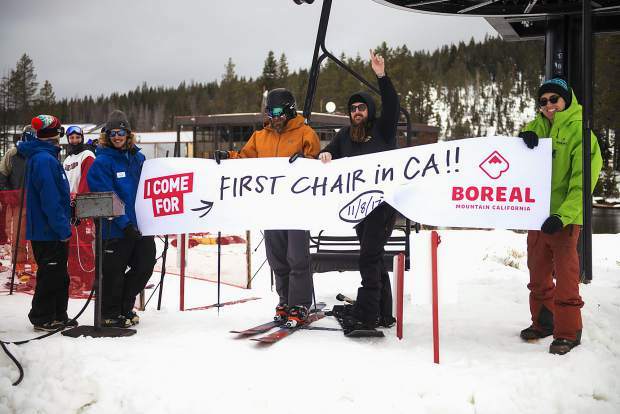 However, the Boreal park crew made sure no one was left out on opening day, littering the run with rails, boxes and other features for more advanced riders. “They keep the entertainment factor high and are really persistent about keeping features up, and keeping them maintained,” said Cooper Davidson, 24, of Truckee. There isn’t a lot of the mountain open at this point, with one way down from the Nugget lift, but it’s enough to get a taste of what’s to come at the resort, while knocking off some of the rust that may have accumulated since Boreal’s final day of the 2016-17 season on July 1. The resort reported 7 inches of snowfall from last weekend’s storm for a 4-inch base, but with cold temperatures, and snow forecast throughout the week, it likely won’t be long until guests can enjoy more of the mountain’s 33 trails, and eight parks. Boreal is also one of the few resorts in the area to offer night skiing, and is open from 10 a.m. to 6 p.m.
Michelle Hammond, of Reno, brought her 10-year-old and 14-year-old children up for the family’s first opening day. It took getting off work and a quick change out of school uniforms, but the Hammond family made it to the mountain for the final few hours of late afternoon riding. “Something in us — as soon as we heard it’s open, the adrenaline starts pumping. It’s been all week to prep for this,” said Hammond. Opening day also included the turning on of the Boreal and Woodward Tahoe solar panels, according to Norred, which will generate 325,000 kilowatt hours annually or enough to power 30 residential homes. With 715 solar panels atop The Bunker at Woodward Tahoe, Boreal Mountain Resort has California ski industry’s largest onsite solar collection system. For more information on the resort visit RideBoreal.com.